I’ve always loved the charm of the 1920’s. It just seems like a classier era and nothing is as smooth and classy as the Lindy Hop. It took a little convincing to get my husband to agree, but soon I made him a Lindy lover too. Let me explain. The Lindy Hop is a dance that evolved from the Jazz era in Harlem, NY. It was named after Charles Lindbergh “hopped across the Atlantic” in 1927. I started dancing because my Grandmother loved everything “Swing,” and she made me go with her to the Pasadena Ballroom Dance Association, with the Steven’s Sisters. I even got to meet Frankie Manning, one of the founders of Lindy; not once but twice! But as an awkward middle school girl, I became too self-conscious to dance with the rotation of partners so I stopped. When my husband and I started dating, I asked him to join me in lessons. It only took us a couple of lessons to figure out that most people learn by NOT dancing with each other at first. If you make a wrong move or your significant other steps on your toes; it’s only a matter of time before you start blaming each other for the wrong move. Not Fun. No one wants that. So, you rotate partners and learn with everyone. Then you can appreciate dancing with whoever you came with. Don’t worry; if you can count, then you can dance. Not only will you dance with many people, but you may find yourself with a female lead, or a male follow. Some of the best leads that I have danced with have been women (no offense men, she just knew what a follow needed in a lead). The Jazz era and SwingKids were always ahead of the times for the LGBT community. Pomona’s Art District has old Hollywood charm. It’s the perfect venue to learn Lindy! The lessons are taught by Josiah Keagy, and you will learn fast! The Metro has a beautiful dancing floor with sparkly chandeliers to remind you of old Hollywood, free parking and inexpensive lessons at $5 dollars per person an hour before social dancing. There are all age groups spanning the dance floor, so awkward women like myself (I haven’t changed much) don’t feel self-conscious. This Wednesday, Jonathan Stout and his Campus Five perform for the Social dance right after the lessons. 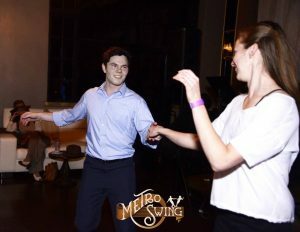 You can swing every Saturday at Disneyland, Clifton’s Cafeteria, the Queen Mary, and countless other places in Pasadena, San Diego, and Irvine. Once you start, you will end up learning more variations of swing dancing. My hubby’s personal favorite is the Balboa, which originated here in California just as the name suggests. Mine is West Coast Swing or the 8 count Lindy Hop. Now get out and come and swing with me! Links below!